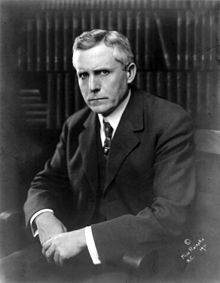 James Alexander Reed (November 9, 1861–September 8, 1944) was an American Democratic Party politician from Missouri. We hear a great deal of talk about idealism, the idealism of America, the idealism of men. There are two conceptions of idealism. If by idealism is meant that a man is so exalted in his purposes that he disregards his own interests from any selfish standpoint and endeavors to benefit other people without trying to benefit himself, that kind of idealism is admirable in an individual. But if by idealism is meant that a man follows visions and dreams, that he does things that are impractical, that will not work out, then that kind of idealism is closely associated with insanity. They tell us that our race is the best type of Christian civilization. Very well; I want to preserve that civilization until Christ does come to earth, and I do not want any individual to assume that he can transform himself into a second Christ by talking about idealism. Every once in a while, you know, there is a gentleman who imagines that he is Napoleon, or Caesar, or Hannibal, or Mahomet, or the Saviour. The trouble is, they are idealists; they are not practical men. Suppose we sit down here and say to ourselves, "Some day, somewhere, in some remote century of time, people are going to be so good that they will not kill us, and therefore we will throw away our weapons and give them several thousand years in which to butcher us"; and suppose that in the meantime this race of men to which we belong, and which is all that represents real civilization in the world, is destroyed. There will not be anybody to recognize the millennium when it does come. There will not be anybody with enough idealism to know what it is when he sees it. This page was last edited on 11 November 2018, at 17:02.